Twinlab Tri-Boron Review – Is This Product Safe To Use? Twinlab Tri-Boron is a dietary supplement that is designed to help alleviate joint pain. The manufacturer claims that the product is made from all natural ingredients that are regarded as safe and effective. This in mind, the product is readily available over the counter without a prescription. Twinlab Tri-Boron is designed for both aging people and people who suffer from joint diseases relating to arthritis and other opportunistic conditions related to joint health. What is the Company Behind Twinlab Tri-Boron? Twinlab Tri-Boron is an all-natural dietary supplement that is designed for people who are suffering from joint complications. All the same, you don’t need to have a joint condition to take Twinlab Tri-Boron. You can take if you are looking to have strong joints and ease of joint movement. According to the producers, this product will improve mobility in aging persons and people who are actively engaged in physical activities such as sports will have stronger joints. This product is manufactured by TwinLab LLC. This is a registered company that specializes in making supplements and vitamins. 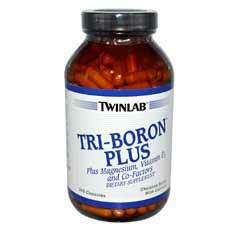 What are the Ingredients Used in Twinlab Tri-Boron? Boron – Research has directly connected boron deficiency to arthritis. In a study conducted on sheep, there was direct link between sheep with boron deficiency and arthritis. Sheep in areas where there was no boron were more likely to have arthritis than sheep taking boron supplements. Magnesium – Is an alkaline metal that is available abundantly in water, vegetables meat etc. Despite it being abundant, deficiency still occurs and thus in some cases, some people need to take magnesium supplements. Magnesium boosts the immune system and magnesium deficiency is associated with weal bones and low bone mass. Calcium – This is the most abundant mineral in bones. Calcium deficiency has been directly linked with fragile bones that are prone to breaking. It is regarded as the most important mineral composition of bones and teeth. Vitamin D3 – Vitamin D increases the absorption rate of calcium. How does Twinlab Tri-Boron Work? What are the Pros of Twinlab Tri-Boron? Although may take little more time but will give the very good results. What are the Cons of Twinlab Tri-Boron? What are the Dosage Instructions of Twinlab Tri-Boron? You should take up to three capsules a day depending on the extent of the damage. If the product was given to you by your caregiver, you should follow the instructions as directed. Seek advice from your caregiver prior to taking this product if you are pregnant or breastfeeding. Is Twinlab Tri-Boron a Scam? Twinlab Tri-Boron is not a scam. There are no fraud cases associated with the product or its manufacturers that have ever been reported. When used as directed and for the intended reasons, then this product is as advertised. Twinlab Tri-Boron is a dietary supplement that has some great online backing up. The reviews are very encouraging and so is the list of ingredients. All the same, the product falls short when it comes to vitamins. We believe we have reviewed a better or equally good product that can effectively compete with Twinlab Tri-Boron.